Spectacular Santorini– scene of one of the world’s most violent volcanic eruptions around 1450 BC — is inarguably the most scenically dramatic of all the Greek islands. Officially the island is Thira, yet the Latin name of Santorini persists. With its pitch-black beaches, rugged landscape and stunning caldera (volcanic crater), it’s more akin to one of the Canary islands than the Cyclades, though its whitewashed churches and clifftop houses score highly in the charm stakes. This is the island for lovers of natural beauty, though sun seekers may not fancy its beaches. Best views are from the cliffs bordering the caldera,　which was formed when the center of the island basically collapsed into itself. Geologists marvel at the cliffs’ multi-hued strata of rock, lava and pumice, so take your camera and be prepared to feel the earth move (perhaps even literally — Santorini’s most recent major earthquake was in 1956, although there was one nearby as recently as June 26, 2009. It’s worth remembering that the bay surrounding Santorini is actually the world’s largest volcanic crater, created 3500 years ago by a massive eruption of the Thera volcano (which is still active). The bay is also believed by some to conceal the legendary lost city of Atlantis. There’s plenty here to set your imagination working. even though the modern-day city of Thira, officially Fira, was completely rebuilt after an earthquake in 1956. Santorini is foodie paradise. Volcanic ash from eruptions throughout antiquity have fertilized the island, so that the quality of produce here is a genuine wonder of nature. More than 2000 restaurants dot the 60 mile (97 kilometer) island. Meals start with mezethes, small appetizer plates. Sample white eggplant, a sweet variety unique to the island, capers, cherry tomatoes, barley rusks, and patties and dips made of fava beans. Minced meat is a specialty here. Try moussaka, minced lamb with eggplant or pastitsio, minced beef with macaroni and bechamel sauce. Santorini’s vineyards are superb. Most local wine comes from the Assirtiko grape, a fresh white. Nykteri is just as fresh, but more potent. For a phenomenally aged red, try the Mavrotragano. Shopping is a fun, flashy affair in Santorini, Shops are boisterous and can be packed with folk art, handcrafts, leather, fabric goods and wine. In Oia, markets are authentically Greek and cater mostly to locals. Fira has more souvenirs and is the perfect place to buy a luxury trinket or two. Guests wishing to go ashore from 8:00 am must obtain a colored tender ticket in the Riviera Lounge from a member of Destination Services. Please wait in the lounge until directed to the gangway on Deck 4. Unless you have difficulty walking, please use the stairs to gain access to the tender embarkation platform. Please Notes: All Oceania shore excursions will be tendered to Athinios port. All guests with independent arrangements or wishing to visit the town independently will be tendered to the town of Fira. 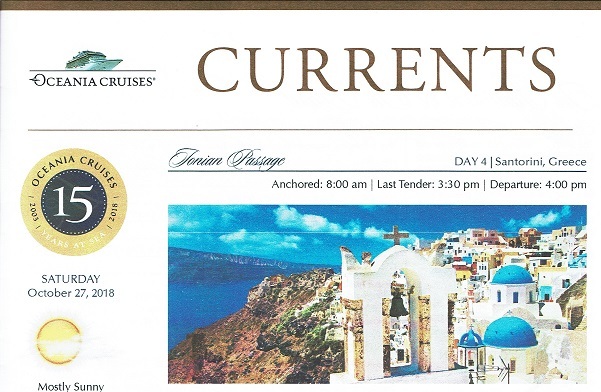 Colored tender tickets are required for all independent guests until the time that the Cruise Director makes an “open tendering” announcement over the public address system. This will be done once the majority of guests have disembarked. Tenders will then operate on a continuous basis from the ship to shore and return; however the time between tenders is approximately every 30 minutes. Guests are kindly informed that the donkey path is not recommended for pedestrian walking as it is the same path used by the tourists riding donkeys on the way up and down between the pier and Fira. There are 600 steps on the donkey path and it could become tiresome and dangerous for pedestrians. The steps on the path are slippery and narrow; and they will become crowded with donkeys. Also, there is no medical assistance provided on the path itself, so　if an accident did occur, there would be no one to assist. We highly advise using the cable car to go up to Fira as it is safer and more comfortable.